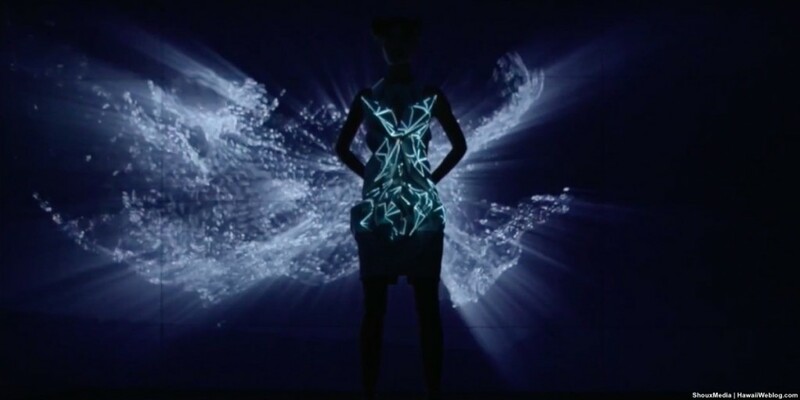 An internationally acclaimed “fashionable technology” designer Anouk Wipprecht is coming to Honolulu next week to lead workshops that will culminate in a Saturday fashion show. 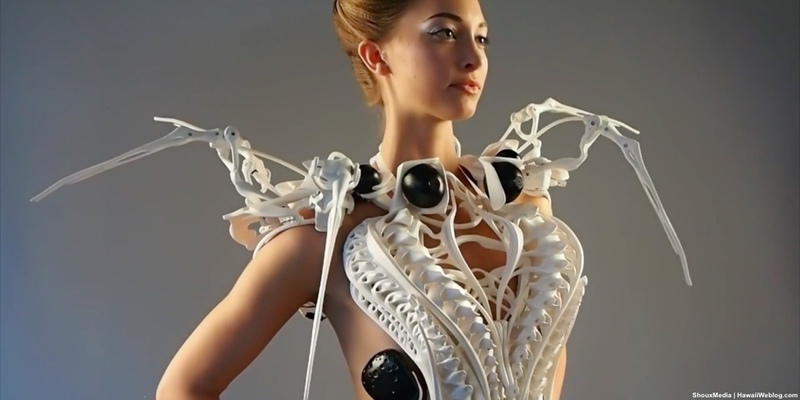 Wipprecht’s work has captured imaginations worldwide, harnessing 3-D printers, sensors, lights, motors, and other materials and tools to create things like her metal electric dress, smoke dress, spider dress, and other wearable tech creations. Her latest? A coral dress! 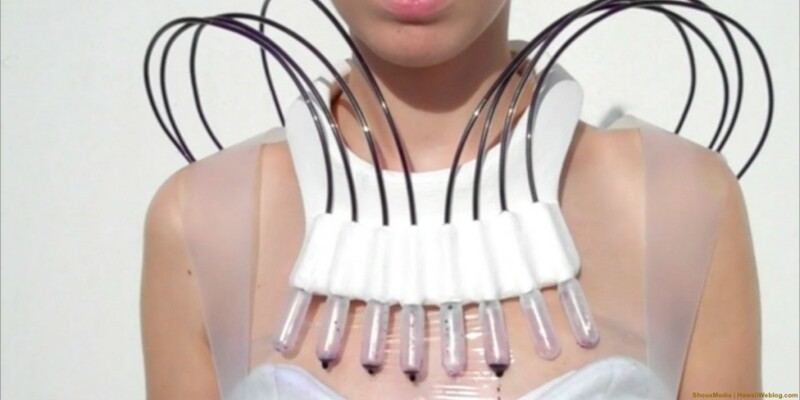 Hailing from the Netherlands, she describes her specialties as “robotic fashion” and “intimate interfaces.” And thanks to local makerspace HiCapacity, Wipprecht will spend several days sharing her skills and insights with local designers and makers. The workshops will help local fashion designers dabble in technology, with the help of local makers. For example, wearable creations could be built to react to certain responses, employing cameras, motion sensors or sound sensors. And many popular maker tools will be in the mix, like Arduino, Teensy microcontrollers, Neopixel LEDs, XBee cloud connectors, soldering irons, code terminals, and yes, sewing machines. Organizers are trying to recruit as many volunteers as they can, and Hafner said HiCapacity is also open to helping newcomers pick up some basic maker skills before the workshops begin. And while the volunteer engineers and tinkerers learn about design, Hafner says the participating fashion designers might develop a taste for tech. “Hopefully we can give them a chance to learn experientially how that kind of stuff works and maybe dip their feet in just a little bit, and hopefully they’ll come back and do more in the future,” he said. As for the fashion designers, Chen said the workshop will be open and accessible. And having followed Wipprecht’s work for years, she’s giddy about meeting her and introducing her to the Hawaii design community. After the workshop, the designers and makers will focus on turning their ideas into reality. And on Saturday, there will be a fashion show where their creations will be showcased. “Anouk Wipprecht is very experienced and has a very strong team coming with her, and with the support of our volunteers, I’m sure we’re definitely going to see something amazing,” Chen said. But what’s key, she says, is that everyone will have the room to play and explore. The workshops run from Tuesday, Nov. 10 through Thursday, Nov. 12, each day from 10 a.m. to 3 p.m. They’ll be held at the Manoa Innovation Center. The fashion show will be on Saturday, Nov. 14 at the Modern Hotel in Waikiki. Tickets are $100, but volunteers who work two shifts earn one free admission. For more information, visit the HiCapacity website, or email HiCapacity’s Jessica Grazziotin at jlblanke@hawaii.edu. The Anouk experience was interesting but to me, did not fulfill the expectation….the local tech community IMHO were just the tools. I guess there will be a video from the even but not sure if any of the tech that we worked on will see the light of day. I know there were a lot of people involved. They supposedly reconvened on Sunday and probably did a heartfelt send off for Anouk so I assume everything ended in good spirits but me as an observer found it somewhat lacking. What an exciting collaboration. Based on the comment above, it sounds like there may have been some unforeseen complications in the end–maybe next time the kinks will have been worked out and the show can be delivered. I’m definitely intrigued by Anouk’s vision. Thank you for sharing the story here!